Is this the new abc.net.au/news? 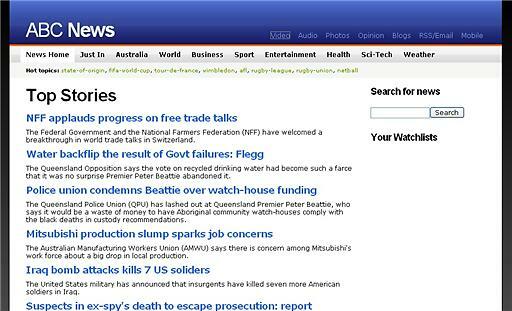 Published on January 31, 2007 in ABC1 and Web Misc. 8 Comments Tags: , ABC1, abc.net.au, web design. 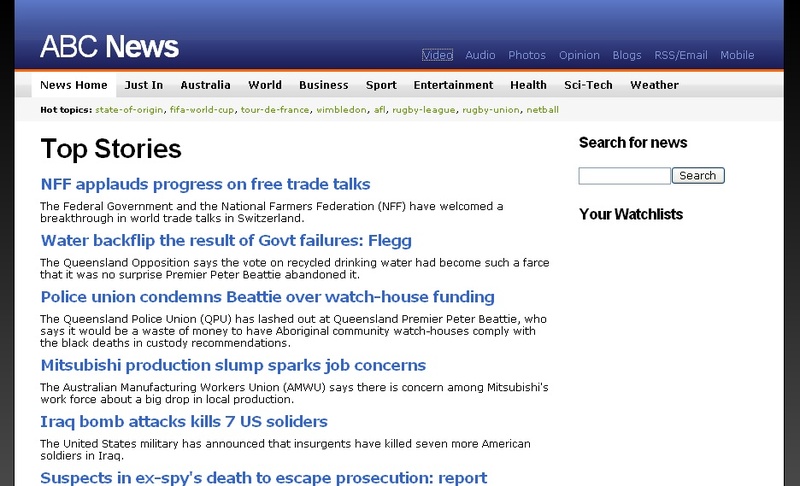 The ABC has been talking about relaunching their news site for a while now, and if the above screenshot I recently received in my email is to be believed you could be looking at a draft of the national broadcasters new news frontpage. Only time will tell I guess.. click the screenshot for a better look. Published on January 30, 2007 in Seven Network, Videos: Openings and Videos: Broadcast News. 11 Comments Tags: Seven/Prime, studio 06, sunrise. Sunrise relaunched its look yesterday, the above videos introduce the new set; take you on a tour of their new home; and talk about the new graphics along with showing off the new weather respectively. Sunrise has never been about news for me, and Seven probably planned it that way, I still find the subtle humour and drama of the “cast” the most interesting part of the show. It reminds me of Aaron Sorkin’s Studio 60 on the Sunset Strip, and while the behind the scenes probably aren’t quite as dramatic I’d like to think it would make for just as interesting a show. I thought I should at least post something from this trip of mine, not 100% sure what it is I’m even posting here, but I head back on Saturday so English speaking normality should resume next week. Happy Australia day from Paris. I’m in Hong Kong waiting for my connecting flight to Paris and moderating comments… when my new best friend “SBS dude” commented this video from the relaunch of SBS news, which starts Monday. Also, Sam from zspace, the folks behind the new ABC1 idents also commented here. Thanks everyone! I’m going to Paris for the week, I leave tomorrow, and get back the following Sunday. So I won’t be in Canberra for Australia Day, but I guess I can still listen to the hottest 100 online. Crikey has already weighed in on the soon to launch one hour SBS World News, and while I’m not a fan of more ad breaks (although it further justifies keeping the ABC ad free if nothing else), I have to congratulate SBS on introducing someone too young to have ever heard of Roger Whittaker to his ‘New World in the Morning’. Sunrise may be at the top of it game, but thats not going to stop them from keeping fresh and hopefully winning over what viewers remain from the fallen star that is Nine’s Today Show. So look out for that later this month & the new weather person (figured it out yet?). Above is video of this mornings opener, and for contrast what it looked like nearly a year ago.